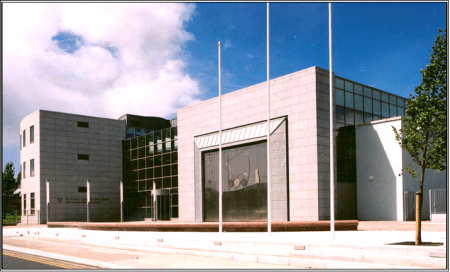 Ballyfermot Community Civic Centre – Duggan Brothers Ltd. The building comprises a quadrant shaped three-storey structure, cladded externally in polished granite slabs, containing offices and civic meetings rooms. This is linked by a service/toilet block core and lift shaft to a two-storey section containing crèche and childcare facilities on the ground floor with kitchen and canteen areas over. These areas are accessed by a contractor designed steel spiral stairs with a 1400mm diameter steel hollow core. The spiral stairs is contained within a glass block tower. A Community hall incorporating both indoor and outdoor stages and with ancillary rooms off is provided. The entrance lobby consists of a full height glazed atrium. The forecourt to the building is finished in a mixture of granite and brick paviours with a 25m long curved polished red granite seat and granite steps to street level.